I don’t usually buy food wrapped in plastic..
… but this week I did. 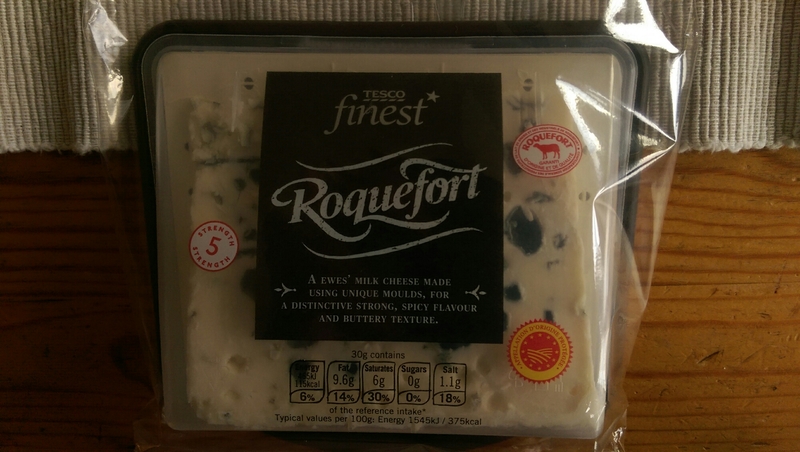 I was in the supermarket buying washing up liquid, toilet paper and kitchen roll and was suddenly taken with the idea of Roquefort cheese, so I bought some. My butcher sells it too, wrapped in aluminium foil but I was in the supermarket… I took it out tonight to eat and I was struck by the amount of packaging. Plastic tray and lid wrapped in a plastic wrapper. I wonder if the only purpose of the plastic wrapper is to be a place to print the cheese’s credentials and the government’s advice on how much Roquefort one should eat. Since when did government think it knew best about a healthy level of Roquefort consumption? From now on i will only buy my Roquefort from my butcher. In its original foil wrapper, from the cave, and cut to order. No plastic, no government advice. Just cheese wrapped in waxed paper. I will decide how much is good for me.